There were more Filipino acts who passed the audition beyond the number shown on Asia's Got Talent for the past few weeks. There were numerous other talents who got 3 or 4 YES votes and even advanced to the semi-finals who weren't introduced during the show's audition related episodes. Some of those acts include Drac Cigam, a two time Meralco Talentadong Pinoy champion. While AGT didn't air his journey, he had documented it in photos. See Drac Cigam's album. Image is taken from a timeline post in the Facebook page Talented Ako. And this is a post from her actual Facebook page. She added me on Facebook recently. I understand how upset she is. I'm sure it's very devastating that one of the best things that ever happened to her was denied. Other than these two acts, I've seen several other individuals who posted their sentiments in various pages including AGT's own FB page. So why didn't AGT air these segments? I wish I knew why and I can only speculate. 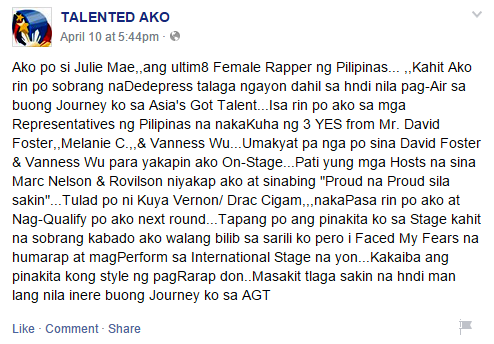 Was it because these talents already announced the good news on their personal pages before the program even aired? The Got Talent franchise where AGT was based from doesn't have a non-disclosure agreement, unlike The Voice right? I'm not sure. Although it's sad to hear about these seemingly forgotten acts, let's not forget that they are also Pinoy's pride and we should be proud of them as much as we are for those who were announced on the show like golden buzzer recipients EL Gamma Penumbra and Gerphil Flores. The show reserves the right of what and who to be televised. It may be a 3-YESes-performance, but if it doesn't fit the taste of the directors/producers, they have the right not to show it in the public. Auditioning and getting 3 Yeses do not guarantee you to be shown on TV unless you are part of the semifinalist which was deliberated even before the showing of the audition acts ended. I agree. I do hope they would at least respond to the obviously devastated contestants though. It's a once in a lifetime opportunity to participate in AGT (even the auditions alone) and to not see your segment on air would be your dreams crashing down to pieces, if you can imagine how that feels. How sure are you that he (Drac Cigam) advanced to the semifinals? According to his page and the one mentioned above, he was pre-selected for the semi-finals (bear in mind it was already done long before the audition shows were aired) but he had to back out because he is unable to bring his props overseas due to ceiling high taxes imposed in his country. Another Filipino talent, Neil (the beat boxer) was supposedly also selected for the semi finals (according to the kid, in an interview) but he had to back out because he's about to graduate and would miss final exams and of course graduation if he pursued the show. Based on that, I would assume that the semi-final shows were actually taped around January-March, before the school year ended here.